Villa with Pool, situated in peaceful locationl. Lift. 3 bedrooms & 3 bathrooms Sleeps 7 Ideal for exploring island. Close to beach, tavernas & shops. Stunning views. Villa Artemis is located just 5 minutes from Vliho village. The villa is on 2 floors with the living accommodation on the first floor to give outstanding views over Vliho Bay and surrounding countryside. The design of the villa was created by the owners and as you will see from the photographs, it is finished to a very high quality with large open-plan lounge, dining and kitchen area. There is access through patio doors from the large open-plan kitchen, lounge, and bedrooms to the terraces. 3 Large bed rooms with 2 en - suite bathrooms and family bathroom beside bedroom 2. A stairway leads down to the private pool from the terrace, and inside from the Lounge to the garage. The garage is situated on the ground floor with entry to the main house via a marble stairway. There is a lift from the garage to the first floor which is suitable for a wheelchair. The doors are wide enough to allow wheelchair access. Large patio areas on first and ground floor /pool area. Villa is situated in the middle of the island 10 minutes from Nidri. and 30 minutes to Lefkas Town in the north and Vasilliki in the south. Easy access to beaches & Lefkas town. We enjoy sailing and had a boat at Craobh Marina 30 minutes south of Oban on the West Coast of Scotland. In 2004, Richard read an article in a Boating magazine about Lefkas Marina and within 1 month we arrived in Lefkas! We fell in love with the island which is very green and and reminded us of the West coast of Scotland, especially looking out from Nidri to Scorpios (Onassis's Island) and the other islands. In 2005, we bought the land which has a stunning view over Vlicho Bay and Nidri. The Villa designed by Richard was completed in October 2007. We retired and moved out to the Villa in March 2008, bought a yacht and enjoyed the villa & sailing with friends and family. We feel very privileged to live our dream on Lefkas. The villa is situated at the head of Vlicho bay with panoramic views of the bay, surrounding hills. Vlicho, Nidri and Geni. It is a very private villa, quiet location but is only 5 minutes from Bakery, supermarket at Vlicho and tavernas, 8 minutes from Nidri and 30 minutes to Lefkas town and Vasseliki. The accessibility to shops and tavernas was a good reason to choose this location , not to mention the views which wowed us! Sitting on the patio, we can hear the goats bells and watch the golden eagles flying between the hills. The yachts, boats and the ferry to Meganissi can be seen from the patio. We love the quietness and peace of the villa. The ferry goes from Nidri to Cephalonia and Ithaka daily. There is the opportunity to have 1 or 2 days sailing from Nidri for those who would like the experience of sailing or to hire a botor boat to explore the many beaches, bays and Meganissi. 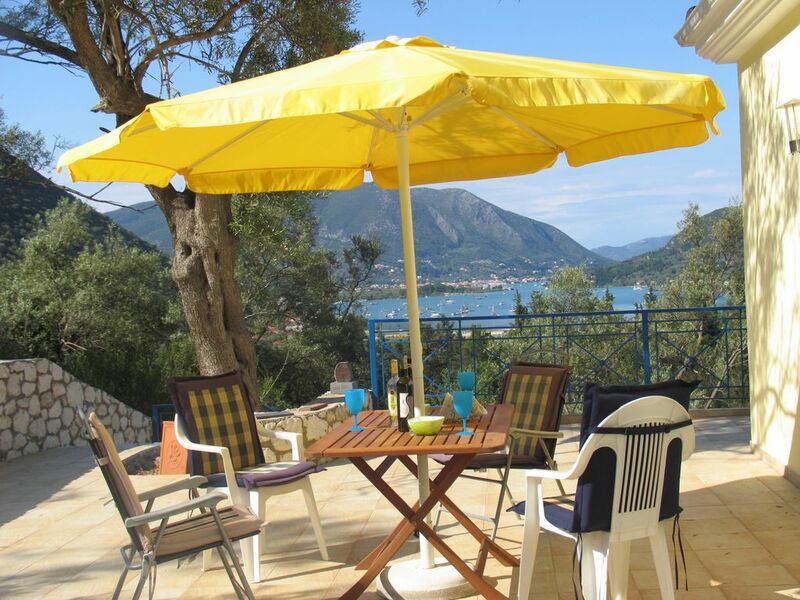 Easy access to water sports at Nidri and windsurfing at Vasiliki sports available. Location of villa is ideal for exploring the island. One of the benefits that the villa has is a lift which can take 2 persons and a wheelchair. The doorways are wide enough for a wheelchair. The en-suite in Bedroom 3 has a walk- in shower, with hand rail and stool. The Lift and Shower were designed to accommodate Richard's sister who has Spina Bifida. Therefore for people with mobility problems the villa is easily accessible from ground to first floor. All Bedrooms open out onto the large tiled patio. There are large patio areas for sunbathing, BBQ all around the first floor. The ground floor and pool area are surrounded with a spacious patio and large patio area at the side of the villa. Everyone can find their own secluded spot if they want some quiet time, which is the beauty of having so many patio areas. Pool has one depth - 1.27m. En-suite to bedroom 1 with basin, shower, bidet, and wc. Bathroom next to bedroom 2 with basin, bath, shower over bath and wc. En-suite to bedroom 3 has basin,walk in shower with hand rail and wc. British style plumbing, so toilet paper can be flushed. Towels and pool towels provided. Spacious open-plan lounge with 2 large 3 seater leather sofas, 1 leather armchair, coffee tables, SatelliteTV/DVD/CD and patio doors to terrace. Dining area has large dining table and 6 chairs and patio doors to terrace. All dishes and utensils . Plastic dishes / glasses for pool area. Large fully equipped kitchen with Corian worktops next to dining area. Electric oven and ceramic hob, dishwasher, microwave, American style fridge/freezer with automatic ice maker and chilled water, kettle and toaster. Fire extinguisher/fire blanket. Open plan dining / kitchen / lounge. Dining area opposite kitchen area. Mature well laid out garden with shrubs and trees. Terraces around pool and lounge, bedrooms on first floor. There is a LIFT from the ground floor to the first floor which opens in the hall beside Bedroom 3. The doors are wide enough for wheelchair users. Bedroom 3 ensuite bathroom has walk in shower, handrails and stool. No smoking in villa. Smoking allowed outside. Pool 32 sqm Depth 1.27m Pool concrete steps and pool step ladder. Pool heated on request and extra cost. Notes on accommodation: The villa is fully air-conditioned and all doors/windows have sliding mosquito screens. Underfloor heating for winter use. Security system with electric security gates. Large parking area. Outside: The villa has an 8m x 4m kidney shaped pool, 1.27m deep all over. Outside pool shower with hot and cold water. Also provided is a BBQ, sun loungers, tables, chairs and parasols. The pool can be heated if requested at an additional cost. Cleaning / Towels / Linen / Maid service: Towels and linen are provided and changed weekly. Pool towels also provided. Towels changed midweek. The villa is cleaned weekly and the pool twice weekly. Free welcome pack. Cleaning Service & Chef service available at reasonable rates. Other: Garage. Washing machine, plastic clothes dryer, ironing board, iron, loungers and chairs are located in the garage. Also a second fridge which can be used to store drinks/food for pool area. Outside garage there is a washing line to dry clothes. We stayed at the villa in 2013 and returned 2015. Beautiful villa with good facilities as described. Roma is very hospitable and friendly and provided good customer care, information of Lefkas, restaurants and attractions. We have booked to come back in 2016. Wonderful Holiday !!!! We have recommended the villa to friends and relatives. Very highly recommended. Wonderful villa with great facilities and close to Nidri. Excellent location for relaxing and sightseeing. The owner was friendly, helpful and provided excellent customer care. Beautiful villa. We will be back next year. Thank you Jackie for your positive comments. Pleased you had such a good holiday with the family and loved the villa. Will be pleased to see you again. As I am disabled, the villa is equipped with a lift and suitable for a wheelchair user. Beautiful villa with excellent facilities, terraces and swimming pool. Very well maintaintained villa. Excellent customer care and starter pack on arrival was very welcome. Great holiday. Ideal location as villa situated in the middle of the island on the east coast. Best villa ever !!!! Closest beach is Dessimi, 2km which is walkable. Vassiliki beach 20 minutes drive, famous for wind surfing. Poros Bay 15 minutes drive, plus many more beautiful beaches around the island. The west coast is renowned for the beautiful sandy beaches approximately 45 minutes to 1 hour from the villa. Ryanair Flights from Stansted to Patras. Car Hire at airport. 3 1/2 hours to villa. Good road. Cost E 13.20 to cross Rio Bridge for car & passengers. For lovely fresh bread every day, there is a bakery 5 minutes drive or 10 minutes walk each way from the villa. (Next to the garage). Nidri has a beautiful esplanade from which you can take many different boat trips to other islands and beaches on the west coast of Lefkas. Booking Notes: Payment of 25% to secure booking, with balance & security payable 8 weeks before departure. All local taxes & services are included in the price & there are no extra costs. Changeover Day: Sunday. Entry to villa 3pm. Departure by 10am at the latest. Changeover days flexible, please contact owner. Notes on prices: Prices are for the property per week in UK Pounds and includes air-conditioning. Payment can be made in Euros at the current exchange rate. For Winter rates contact owner. 5% for 3 weeks booking.